The goal of Educational Biofacts, Inc. is to provide affordable hands-on nature based teaching tools (i.e. biofacts) for science classrooms, nature centers and environmental education facilities*. Our teaching kits are not only affordable, they come with fact sheets and simple ways to utilize them in the classroom. Biofacts are often the key to a learner’s imagination, helping to connect information with the tactile experience. We are continually developing new resources, kits and curriculum ideas that will assist you with bringing teaching to life. Educational Biofacts, Inc. has developed curriculum and biofacts for museums, nature centers, zoos, universities and classrooms. With over twenty years of experience in creating and using biofacts, we offer a wide variety of tools to help you make sense of the science you’re teaching. Why not let us help you bring valuable ideas to your instruction and open the eyes and minds of your learners? * Special educators discount available. Please inquire before placing order. 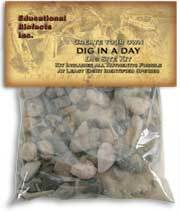 The Dig in a Day kit allows the educator to set up a fun and exciting fossil hunt for the students! This kit consists of ten high quality resin replicas of North American animals. The Fossil shark tooth kit comes with over a pound of fossil shark teeth and assorted ray mouth plates and even a few unusual fossils such as shark, sea snake and fish vertebrae! from five vertebrate classes Fish, Frog, Turtle, Pigeon and Rabbit.